Jyeruey Tech Co., LTD was established in May, 2000, based in Sanchong, New Taipei City, a leading company which is professional in mobile products, accessories, Touch Panel, LCD, Bonding LCD with glass and related project assistant. 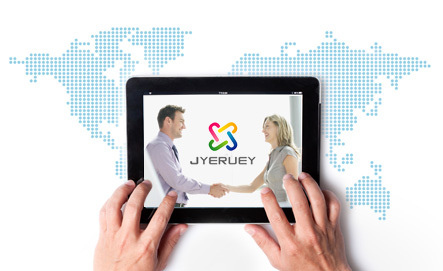 Jyeruey’s headquarters is located in Taiwan and has office in Hong Kong and China.Operation and sales sites are located in, United States, Europe, China and worldwide. Besides, the company has the factory which located in Shenzhen of China. Jyeruey is capable of providing flexibility in production scheduling as well as capacity adjustment to meet different clients' requirements. In a global view, the market will be not easy to grasp, We know the importance about Customer's satisfaction deeply. Ever since the establishment, Jyeruey is insisting to the best qualities, competitive price, fast services, rapidly dealing with the clients’ demand, and implemented the work of serving Clients.